Charles C. Abbey opened the Abbey Pharmacy at 219 Orange Street in 1894. While born in Claremont, Iowa in 1864, at the age of eight, Mr. Abbey and his family moved to Livermore, California. At an early age of 14, Mr. Abbey began working in a general merchandise store and eventually became part owner in a drugstore. In 1887, Mr. Abbey sold his interest in the drugstore and went to Ann Arbor, Michigan to become a pharmacist at the University of Michigan. He returned for a short time to San Diego, but went to Forth Worth, Texas where he married Emma Morison in 1893 afterwards they moved to Redlands. On May 20, 1903, a building permit was issued for the construction of a two-story, seven room home valued at $800 to $1,000 on lot 17 in the Park Villa tract. The builder listed was Ed Haynes. The home is fashioned with a cross gable roof with an open veranda, round columns, and railing in the front. All the windows are double hung and the front steps have a decorative iron railing. The roof trim is boxed cornice with a frieze. The Abbeys are listed as occupants until 1910. Between 1911 and 1917 Miss Gertrude Krick lived in the home. In 1919, Guy and Gladys Daniels, a physical culture teacher, and S. Guy Jones, a professor at the University of Redlands were residents. In 1921 the home was owned by the Eneroth family. Clifford and Viva Jewell lived in the home between 1923 and 1929. Then Margaret and Charlotte Eneroth moved back. In 1936 the home was occupied by Evelyn Grant and George Grant, a solicitor for Goodwill International, lived there until 1941. Between 1947 and 1952 Amos and Lelia Marien lived in the home. Later in 1958 Earl and Ruth Kackley were residents. In 1967 Don and Mary Springer a local contractor lived in the home. Between 1976 and 1983 the home was occupied by William and Carol Stanley. The home was then purchased by Kenneth and Jeannie Hyde in July 5, 1983. They sold the home in 1985 to Larry and Deborah McFatter who are the present owners. The McFatter’s moved to Redlands at that time after Larry Finished graduate school in the East. The home was partially restored. They have completely remodeled a bathroom and five years ago they installed a new kitchen. The home has been painted three or four times. 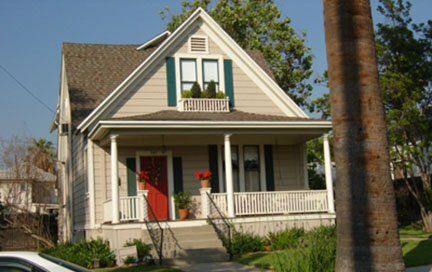 The Redlands Area Historical Society is proud to present this 2006 Heritage Award to the McFatters for their continued stewardship in maintaining this charming example of an early Redlands home.